ICMR Notification is out. ICMR is recruiting for 27 Scientist C Posts. You can check ICMR - Indian Council of Medical Research last date, download ICMR notification, visit ICMR official website and check other ICMR Vacancy details.Complete Vacancy and recruitment Details about 27 Scientist C vacancies in ICMR are provided below by JobSarkari.Com only for you. Mode of Payment Application fee Can be Submitted Through Draw a Demand Draft in Favour of Director General, ICMR, New Delhi. Post Graduate Diploma in Medical Subjects with 02 Years R&D/teaching Experience in the Required Subject. Candidate Must Have Passed MBBS Degree Recognized by MCI with 04 Years R&D/Teaching Experience in the Required Subject. Candidate Must Have Passed BDS/B.V.Sc& AH Degree Recognized by DCI/VCI with 05 Years R&D/Teaching Experience in the Relevant Subject. Candidate Must Have Passed B.Tech Degree in Relevant Engineering Subject with 06 Years R&D/Teaching Experience in the Relevant Subject. Candidate Must Have 1st Class Master’s Degree Paased in the Relevant Subjects with 04 Years R&D/teaching Experience in the Relevant Subject. Candidate Must Have Passed 02nd Class M.Sc + Ph.D Degree in the Relevant Subject with 04 Years R&D/teaching Experience in the Relevant Subject. Maximum 40 Years. 12 15 27. 1.Candidate Need to Apply through Offline Mode. 2.Candidate Have to Download Application Form Given in Important Link Section. 3.Candidate Need to Fill All the Mandatory Details in the Application Form. Q. 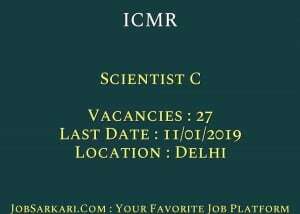 What is the Last Date For ICMR Scientist C Vacancy ? A. 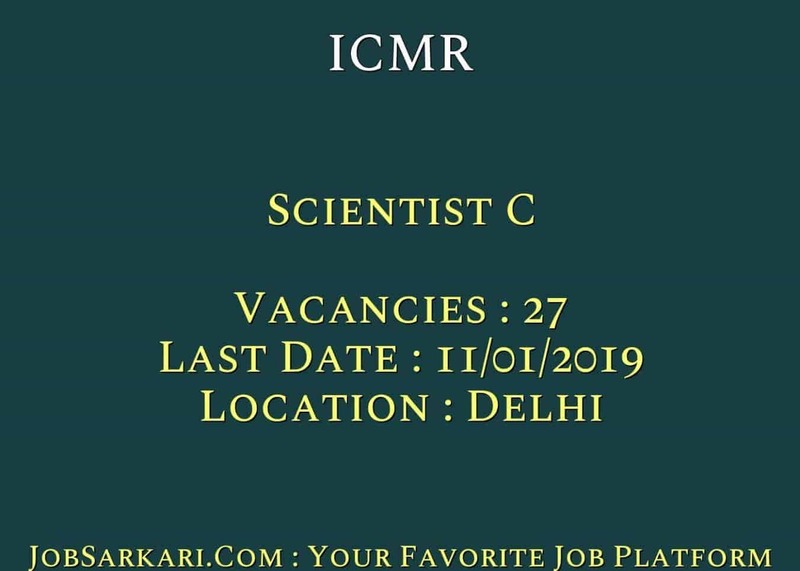 Last Date for ICMR Scientist C Posts is 11/01/2019. Q. What is the Form Type of ICMR Scientist C Recruitment ? A. The Form Type for ICMR Scientist C Posts is Offline. Q. How many vacancies are available in Indian Council of Medical Research Scientist C Posts ? A. There are about 30 Vacancies in Indian Council of Medical Research Scientist C Posts. Q. What is the Full Form of ICMR ? A. Full Form of ICMR is Indian Council of Medical Research .